Wendy Moore's lab investigates the evolution and ecology of terrestrial arthropods. Lab members work on terrestrial arthropod systematics and/or they work on a regional multidisciplinary project on arthropod biodiversity in the Sky Islands Region in the desert Southwest. This project will address how the bombardier beetle evolved its remarkable explosive defense abilities. Geadephaga is the largest clade of organisms that use a single homologous gland system to produce no less than 19 distinct classes of chemical compounds for defense. This project will develop a detailed functional and evolutionary understanding of defensive chemistry evolution by focusing on eight species from the four lineages of quinone producing carabid beetles, including four species commonly known as the bombardier beetles, which chemically blast their defensive quinones at extremely hot temperatures (up to 100°C). Using a multidisciplinary approach, this project will identify and comparatively examine transcriptomes for genes involved in quinone production, elucidate chemical biosynthetic pathways, and describe the genetic architecture of quinone evolution. From gland-specific transcripts candidate genes related to the production of defensive secretions will be identified and gene function will be validated experimentally by blocking gene transcription and looking phenotypic changes in compounds produced and transcription activity in the chemical secretory cells. Biosynthetic pathways of quinones will be confirmed by injection of labeled amino acid precursors and analysis of compounds produced in the beetles’ glands. In order to study the evolutionary history of quinone biosynthesis in carabids we will infer the phylogenetic history of candidate gene families and the tree topology and branch lengths will be analyzed to test whether genes are ancient and shared among taxa, or if gene diversification is recent and specific to certain lineages. We will test the hypothesis that the genes up-regulated in secretory cells during quinone synthesis are closely related to those involved in quinone production in arthropod cuticle. ​​Also see this post and this video. Arndt, E.M., W. Moore, W.K. Lee, C. Ortiz. 2015. Mechanistic origins of the bombardier beetle (Brachinini) explosive pulsed chemical defense. X-ray video of the reaction chamber during a pulsed blast. Video recorded by Brachinus elongatulus, Eric Arndt, Wendy Moore, and Wah-Keat Lee at Argonne National Labs. M﻿oor﻿e, ﻿W. and J.A. Robertson. 2014. Explosive adaptive radiation and extreme phenotypic diversity within ant nest beetles. Current Biology 24: 2435–2439. Marek, P.E., and W. Moore. 2015. 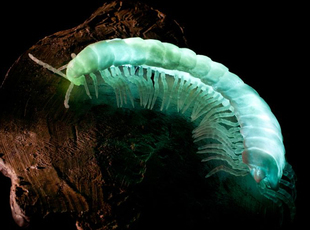 Discovery of a glowing millipede in California and the gradual evolution of bioluminescence in Diplopoda. Proceedings of the National Academy of Sciences, USA. 112: 6419–6424. Marek, P., D. Papaj, J. Yeager, S. Molina, W. Moore. 2011. Bioluminescent aposematism in millipedes. Current Biology 21(18): 680-681.